If you know me, you would know that I hate tomatoes. But seeing as I was not consuming any, I needed to get the benefits in somehow in terms of my skin. It’s a really good antioxidant and can prevent spots and ageing. It’s truly miraculous. It just doesn’t taste good. So I saw this product and was truly interested in how it could get rid of the horrible spots on my face. Then I saw that the product has Salicylic Acid which cleanses the pores and eliminates impurities. It also had 97% natural product such as Tomatoes, Ginger, Mango, and Bamboo. 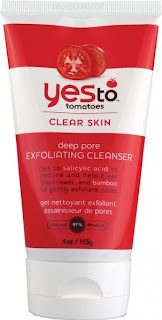 It really gets deeps into the pores and exfoliates the skin. These ingredients battle, blemishes, redness, dry skin and ageing. My thoughts were mixed. I like the product, but every time i washed my face, I felt like it left a layer of something on my face. I’m not sure if it was the xanthan gum or something else, but I felt like my skin was not clean. But it was clean. That's the funny thing, It works. It prevents spots. It worked so well. But my face never felt cleansed. It might be the fact that this product does not have any SLS. I’m not sure. But if you are going to use this product, use a make-up remover or a face wipe first. To Buy: There are better ones out there.